You are here: Home / Blog / Adventures in RVing: Where’s the Water? I have shared before how reservoirs provide great boondocking locations in the fall when the water levels are lowered. Most reservoirs provide the following: public property (i.e. it is your land to camp on), miles of firm gravely shoreline is exposed, great views and best of all is having a waterfront campsite for free! On a recent trip traveling south of Winnemuca on I-80 my wife and I decided to spend the evening on Rye Patch Reservoir. We had camped there several years earlier utilizing a nice campsite along the shore. We enjoyed watching the waterfowl, sunsets reflecting off the water and the steam rising from the water on a cool fall morning made for some amazing photographs. Imagine our surprise upon nearing the shoreline to find a dry lake bed. Thinking it might be just this particular inlet that was dry, I parked the RV and went for a stroll. Walking over the ridge to the main body of the reservoir offered more of the same. Miles of dry lake bed with no water in sight! With no need to drive farther to obtain a waterfront campsite we settled in near the boat launch that was equipped with a fire ring and grill. Still not a bad spot to camp for the evening for free. Late in the afternoon we were treated to a beautiful rainbow proving that God has a sense of humor. I found the irony of us camping along a dry lake bed and the rainbow (God’s promise never to send another world wide flood) being rather funny. 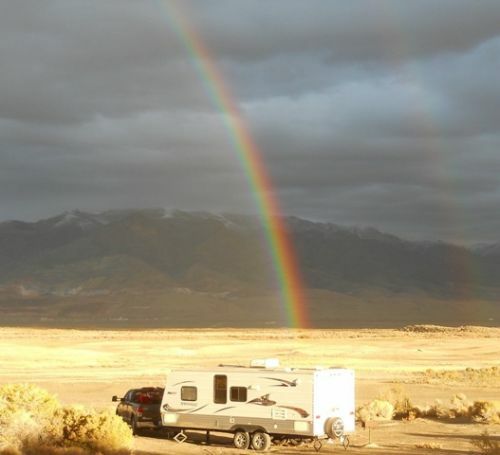 Dry lakes and rainbows, just another adventure in RVing!